The CR308 is an easy to use sound level meter that meets the standards to Type 2, as required by many noise measurement standards. It measures the Fast or Slow sound level with both "A" and "C" frequency weightings. 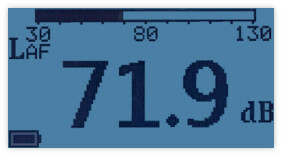 It is essential that a sound level meter meets these standards if it is to be used for any important measurements, particularly those that involve any other legal purposes. The CR308 meets the strict demands of ANSI S1.4, IEC 61672 and IEC 60651 and is provided with a Calibration Certificate at no extra cost, so you can make your noise measurements with confidence. 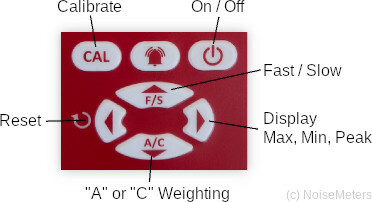 The CR308 measures the instantaneous sound level with either A or C weighting. Most noise regulations require A weighting. It also has both Fast and Slow time response. Many regulations require Fast but some, like the US OSHA regulations use Slow as it is easier to average by eye. To satisfy the OSHA occupational noise regulations, a sound level meter should meet ANSI S1.4 to Type 2 and measure the Slow, 'A' weighted Sound Level. The CR308 meets these requirements and so is suitable for a basic occupational noise survey.